(MONTREAL) – Natural Resources Canada’s Office of Energy Efficiency announced today that the Toyota Yaris and Toyota Prius were each awarded the title of best-in-class for fuel efficiency from the 2009 ecoENERGY for Vehicle Awards. 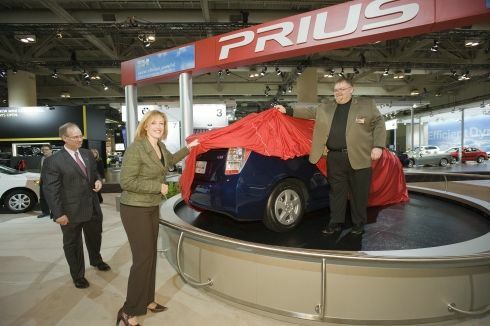 Earlier this week, Toyota also unveiled the all-new 2010 Prius - the ambassador of the sustainable mobility revolution. On sale this spring, the 2010 Prius will offer Canadians even more innovation, versatility, choice, safety, and value and while setting the stage for the future of transportation. With the announcement of the 2009 ecoENERGY for Vehicle Award winners and the reveal of the 2010 Prius, Toyota continues to demonstrate strong commitment to engineering environmental innovation that brings progressive and proven transportation solutions to the world. Over one million Toyota Prius have been sold worldwide since it was introduced in 1997, making it the best-selling gasoline-electric hybrid, and an icon for fuel-efficient vehicles around the world. As Canada’s Most Fuel-Efficient Mid-Size vehicle, the Prius achieves a remarkable fuel-efficiency rating of just 4.0L/100km city and 4.2L/100km highway. Toyota’s environmental innovation extends beyond hybrids to their line up of fuel-efficient, conventional gasoline-powered vehicles. The gas-sipping 2009 Toyota Yaris (manual transmission) is named Canada’s Most Fuel-Efficient Sub-Compact for the fourth straight year and achieves a fuel consumption rating of just 6.9L/100km city and 5.5L/100km highway. The Yaris has won the popular Sub-Compact category every year since the model was introduced to Canada.